His critical assessment of unbundling seems to undermine or ignore what is par for the course for the majority of courses and the practice of history in general. He asks, "Why should anybody provide content for their classrooms, they ask rhetorically, when the best professors in the world can be piped in via the Internet?" Isn't the logical extension of this concern making sure all content of the course is solely from the instructor? That is, are instructors performing an act of unbundling every time they use outside textbooks, articles, documentaries, etc? Furthermore, then should we not expect historians to use technology to locate and collect the best materials possible when conducting research? Why should we expect a world-wide scouring of solid evidence and resources when composing a history article but when it comes to students, assume that the instructor knows all and sees all despite having a limited and almost-singular focus on history (that is, a specialization)? Unbundling is what all of us do every time we select materials that we ourselves did not create such as textbooks, journal articles, or documentaries. Pretending that using video lectures from others who may have a better capacity to present the material is different is making a false distinction. His assumption that "there are very few history MOOCs compared to the number of MOOCs in other disciplines" because "many other history professors with the opportunity to teach MOOCs have been scared off by the pedagogical sacrifices this kind of teaching would require" is an inaccurate claim with no research. That would be akin to assuming that since the earliest of films were largely documentary and depiction of the world as it is, it must be because storytellers saw nothing to be gained from storytelling in the cinematic form and never would. He also seems to imply that no one is interested in doing history MOOCs and yet there are currently over 70 history MOOCS being offered (http://www.mooc-list.com/tags/history). Maybe that is "few...compared to the number of MOOCs in other disciplines"--but his implication that this is a pedagogical choice is poorly researched and understood. MOOCs started in the sciences which is why he offhandedly notes, "Computer scientists, for example, seem to love them." In part because that's where MOOCs started in these disciplines in the late 2000s and took time to make the transition into other disciplines. Yes, there aren't as many but there are clearly more and more coming. He describes "flipped classes" as "Loading them [students] down with taped lectures." Again, this appears poorly presented in that if he had researched flipped classrooms or enlisted the aid of an instructional designer, he would discover that when done with pedagogically sound methods, flipped classrooms are not merely "taped lectures." Believing that a flipped classroom is just "taped lectures" is like believing that watching a recorded theater performance and watching a cinematic adaptation of a play are the same thing. He laments that "Unfortunately, any other historian making use of their content will have to adapt to their particular historical content preferences. I can’t help but wonder whether students will understand who their real professor is in this situation." Well, here's a question: how often are instructors confused for the authors of the textbooks they use in the course? How often is the instructor confused for narrator or host of a documentary watched in class? The answer is probably never or so rare that, the question is silly. He also grows concerned about the potential use of celebrities in MOOCs. Well, if using Matt Damon for the lectures (and in truth, this isn't much different from when an instructor uses a documentary with a famous actor narrating it) can show improved student learning and retention, should we not consider using it--just as we have used celebrities to endorse and encourage other beneficial content and behaviors? Isn't part of what learning is about emotional connection and if an actor can help one emotionally connect, why is that not a legitimate consideration for learning? How much training of faculty is there before they step into a classroom about emotional connection and engagement? Unless you have acquired it outside the discipline through out means or training, there's little guarantee that you have this skilset for the classroom. I've listened thousands of audiobooks in the last two decades and professionally reviewed well over 800 of them. Without a doubt, the professional narrator always does better than author who narrates his or her own book. There are definitely exceptions, but on the whole, the professional narrator is better at communicating in his or her professional endeavor. Wherein the author usually does exceedingly well is when he or she has a background in broadcasting already. The fact is, training someone for years in researching, writing, and professionally presenting historical research is poor training for communicating and engaging with a lay audience (i.e. college students who have little to no interest in history). How often have we been bored to death by a professional presentation or fought our weighted eyelids as we tried--TRIED--to get through some journal article? The real thing that scares the author is: "Yet such sacrifices are only one way that MOOCs could de-­professionalize, or even de-­skill, large segments of the professoriate. Historians who do not select their own content or write their own lectures could easily be replaced by personnel with less training, perhaps graduate students or people with no training in history at all. Or perhaps the schools that license history MOOCs will hire no onsite teaching help whatsoever and simply let students fend for themselves." This brings us back to the earlier point about history as a trained discipline. Rees is largely scapegoating technology for the actual threat: the history discipline. How many master and doctorate programs are geared towards producing historians (not including those focused on creating middle and high school history teachers) actually spend any programmatic time on exploring pedagogy for teaching at the college level? And assistantships do not count--given they are working with live specimens, have inconsistent levels of supervision, and largely are thrown into classes without any training about teaching. The MOOCs are not de-professionalizing anyone; the discipline is doing so if it isn't actively and consciously training historians as educators (if in fact that is part of the purpose of the history discipline). Yes, history programs often do well at training the historian to study history but studying history and teaching history are about as far apart as being a mechanic and being a race car driver. Yes, there is bound to be some overlap but the history discipline largely leaves it to chance that the mechanic is interchangeable with the race car driver. Pretending that one goes hand in hand with the other is a failure to understand that learning is not the same as teaching. Here's a great example: The very university that Rees teaches at has a Master of Arts in History. How many courses are required by Masters' students on pedagogy to complete the degree? Zero. How many courses on pedagogy or instruction are offered even as electives within the history discipline? Zero. Yet, a graduate with an MA in History can often start teaching at the college level. If Rees is bemoaning the loss of professionalism within the history discipline, he would do better to actually establish professionalism around instruction within the discipline . With that in hand, maybe MOOCs wouldn't be as big of a threat as he poses them to be. However, he is right. 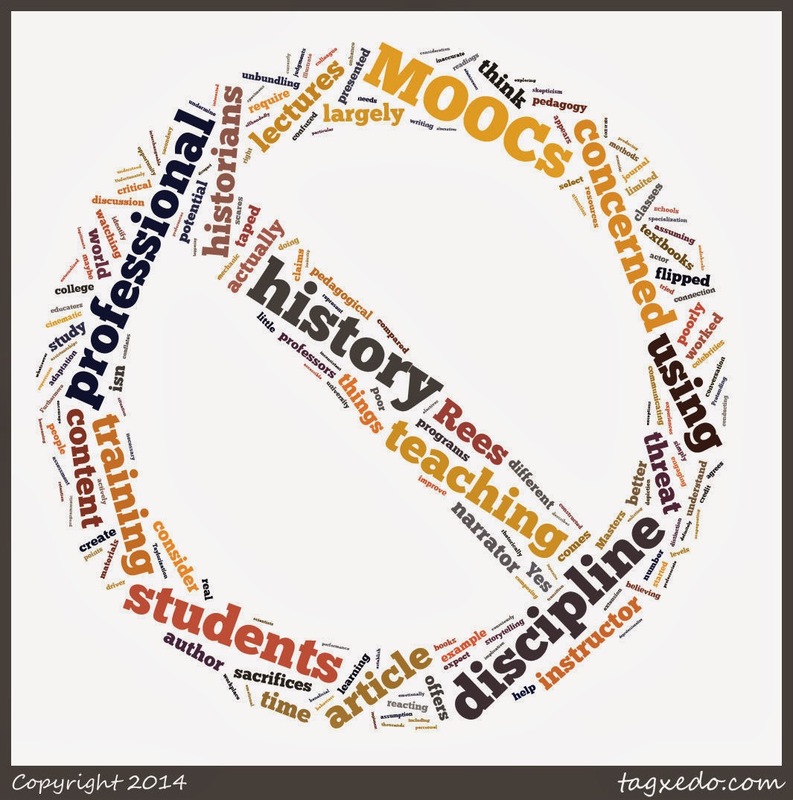 There are many concerns to MOOCs, though most of them are a matter of time and tweaking. He points to optional readings as a concern or "sacrifice". That's not a real concern. One can require readings--they just need to be accessible to students and not externalized costs at the student's behalf. If he considers this a "sacrifice", then may he should reconsider why he is critical of the idea that using other professionals' resources in his classroom since the books he assigns for courses are just that. What I find most damming about the article is that as a leader, he offers poor leadership in this regard. He bashes the MOOCs (with poor arguments) but offers nothing in contrast. He agrees with Aaron Bady that MOOCs "could be done well, I think, but it won’t be." However, rather than identify and paint a pathway towards how it could be done right, he simply condemns the MOOCs and says that MOOCs are something that "no credit-­awarding university should tolerate." Whether it's MOOCs or some other use of instructional technology changing the standard way of things are to be questioned, but they are also to be considered for the ways in which they can improve current teaching and learning. They are an active conversation happening on campuses across the world and Rees (at least in this article) appears to be saying, don't engage in the conversation. Stick your head in the sand and wait till the threat passes. I'm sure history abounds with examples of how well this strategy has worked. If Rees and others are truly concerned that the MOOC will create a poor product and potentially deprofessionalize instruction in higher education, then it's time to up the game. If MOOCs are as true a threat as Rees wants us to think, then we better damn well have alternatives in place when administrators come knocking at our colleges looking to implement MOOCs for credit. It then becomes our imperative to leverage technology, where professionally relevant, to improve and enhance the experiences of our students. In the next post, I intend to do just that: identify different ways we can enhance students experience, maintain professionalism, and save money. In the end, I agree with Rees that we should be skeptical of new methods but that skepticism needs to be more than just disregard. We have and create a lot of unnecessary roadblocks and tediousness for our students and as other colleges and alternative to colleges remove these roadblocks, we owe it to our students to make things more streamlined, accessible, and engaging.